Left: Local medical workers offer free medical treatment to a farmer in Changyang Tujia Autonomous County, Hubei Province. 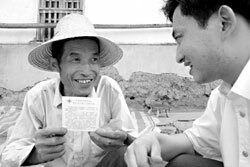 Right: A farmer is glad to receive a health service card from a local medical worker in Changyang County. With the whole nation geared up to fight a possible bird flu epidemic, China's fragile rural medical system is once again attracting people's attention. "The rural areas of China are more likely to be attacked by various diseases, therefore, to establish a relatively sound medical system in the countryside has become quite urgent," said Wang Hongman, a senior researcher at the Public Health School of Peking University, at a small-scale seminar held at the university last week. At the seminar, Wang released her newest research report on China's rural medical system, which her research team has travelled 50,000 kilometres in the past five years to investigate the factual situations. 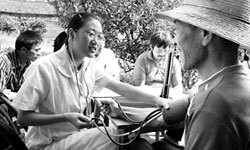 Since the 1950s, China has established a relatively comprehensive rural medical care system. Chen Xiaohong, vice-minister of health, said at the seminar that between 1950s and 1970s, Chinese farmers had some access to first-aid medical services, although what they received was low-level medical treatment due to the laggard economic and scientific situation in China. But with the market-oriented rural reform, the collectivism-based rural medical system has been impacted seriously. Now, inexpensive medical treatment has become rare and farmers' medical spending has increased significantly. According to the National Statistics Bureau, between 1990 and 1999, the net per capita annual income of farmers increased from 686.31 yuan (US$82.89) to 2,210.34 yuan (US$266.95). However, during the same period, the per capita clinical and hospitalizing costs of a farmer increased from 10.9 yuan (US$1.31) and 473.3 yuan (US$57.16) to 79 yuan (US$9.54) and 2,891 yuan (US$349.15) respectively. By 2003, the per capita income of farmers reached 2,622.22 yuan (US$316.69), but average hospital bills were 2,236 yuan (US$270.05). "It has become quite common for rural families to fall into poverty just because one member of the family has become seriously ill," Wang told China Daily. Given their low incomes, few rural residents have their own medical insurance, Wang said. The challenge is not limited to farmers. Government-subsidized township hospitals, originally established to treat basic diseases among farmers and to support village doctors and small clinics, are being hit by a tidal wave of problems. 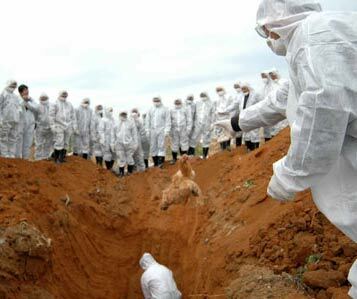 Because of improved transport and the spread of drugstores and private clinics, farmers have begun attending city hospitals for major diseases while going to local drugstores to buy medicines for minor ailments, Wang's research revealed. People are now unwilling to go to the township hospitals, which are poorly equipped. One day during her investigation, Wang was very tired and her eyes became red. She went to a township hospital. The doctor diagnosed her as having serious trachoma and prescribed expensive medicine. Other problems, such as high medicine prices and unemployment, also threaten the existence of township hospitals. Zhang Shuguang, a rural epidemic prevention worker in a township in Beijing's Yanqing County, said she understood farmers' complaints. But, because of the low income offered by township hospitals, many skilled doctors have resigned to set up their own clinics, or asked to be transferred. To reform township hospitals might be very difficult, as many of them have huge hidden debts, Wang said. Peng Peiyun, the State councillor in charge of health work between 1992 and 1997, said that the central government had long considered solutions to problems in the rural medical system. "Our fiscal budget did not have the money to instigate wide reform, at that time we could only offer encouraging policies," Peng said at the Peking University seminar. 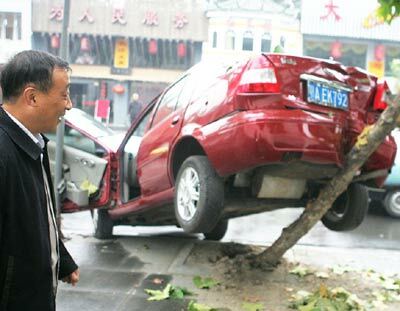 Peng was president of China Red Cross Association. The Red Cross is collecting money to establish a fund to help extremely poor farmers pay for medical services. With the fast economic development, tax revenues have increased significantly. In 2003, the central government launched a trial of the new rural co-operative medical care system. The principle of the new system is to stop farmers from falling into poverty as a result of disease, Chen said. Under the new policy, the central government, local governments, and individual farmers each invest 10 yuan (US$1.23) per year to establish a medical insurance account. The money accumulated is then used to fund hospital treatment. 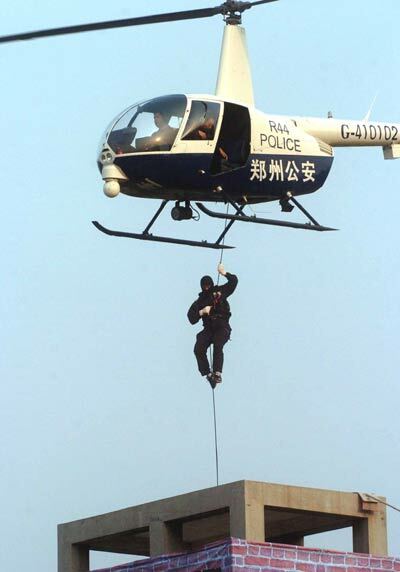 However, Wang's investigation has found the new system has its own problems. Many farmers were reluctant to pay the 10 yuan. In order to attract them, the managers of the new co-operative medical care system in some places promised to reimburse their clinical costs as well as major hospital bills. As a result, in those places, co-operative medical care system is on the verge of bankruptcy. For some farmers elsewhere, the claims procedure is too complicated to be bothered with, Wang said. In addition, under the trial co-operative medical care system, rural patients must go to public township hospitals if they want to be reimbursed. However, quite many often prefer to go to smaller clinics, where they have more faith in the diagnosis and treatments offered, even though they have to pay their own bills. Increasing migration from rural to urban areas is also a challenge to the new co-operative medical system. In farmers' co-operative medical accounts, one third of the funding is provided by local governments which insist claims can only be made from hospitals under their jurisdiction they will not cover hospital treatment for migrant workers who get treated away from their registered home region. Based on her research, Wang has proposed that reforms of township hospitals and the rural cooperative medical care system be combined. "There is no necessity to keep township hospitals open if they are facing bankruptcy. The State subsidization can be used to fund more village clinics. Meanwhile, funding from the co-operative medical care system should not be tied to public township hospitals," Wang suggested. She said that subsidization should be provided on a competitive basis. No matter private or public hospitals, if they offer satisfactory medical service, they should enjoy subsidization and reimbursement rights. Wang suggested the State set up a circulated medical personnel system, under which doctor must experience both better urban hospitals and grassroots rural or township hospitals before they can achieve promotion. "The circulation of doctors would ensure all hospitals have good doctors all the time," Wang said. However, Gao Xiaoping, secretary-general of the China Society of Administration Science, said Wang's ideas for township hospitals might be naive. Under the current administrative system, township hospitals are part of the township government and it would be very difficult to take this function away from it. In addition, if the rural co-operative medical care is liberalized, ensuring effective monitoring of medical institutions would be a huge challenge. Vice-Health Minister Chen praised Wang's efforts, but said more research must be done before the rural medical system is reformed. In the coming five years, the central government will arrange a total investment of 20 billion yuan (US$2.46 billion) to support the rural medical system.